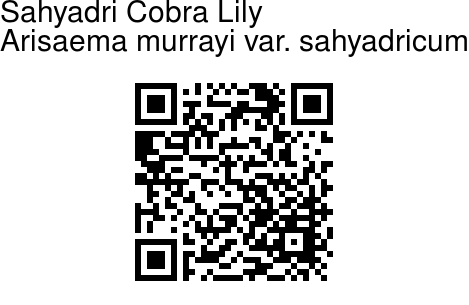 Sahyadri Cobra Lily is a perrenial herb. Corms are 1.3-5 cm across, oblate, roots fibrous, arising from the upper side of corm. Leaflets are 3-9, radiate, stalkless, each 4-16 x 2.5-7.5 cm, broadly elliptic-obovate, base narrowly wedge-shaped. tip abruptly long-pointed, darkgreen above,light green and glossy below, primary nerves 11-30, Peduncle is much shorter than leaf-stalks, 4-10cm in length, 0.25-1 mm in diameter, longer in infructescence. Spathe is 3-5.5 cm long with narrow funnel shaped convolute tubular, basal portion of Male spadix with floriferous part 1.5-2.5 mm long, staminate flowers are numerous, scattered, sessile, shortly-stalked. Spadix-appendix is short, 2.5-3.6 cm long, cylindric, thick, gradually pointed, at tip, recurved. 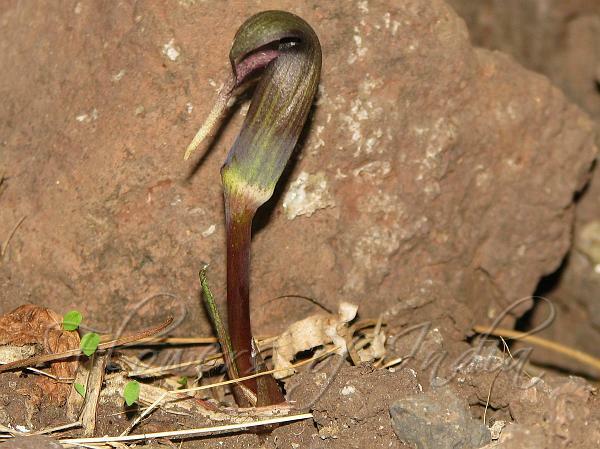 Sahyadri Cobra Lily is found in Western Ghats.